In 2014 the Vasculitis Foundation created the Vasculitis Clinical Research Consortium (VCRC) -Vasculitis Foundation (VF) Fellowship Program in Clinical Investigation. The VCRC is an integrated group of academic medical centers, patient support organizations, and clinical research resources dedicated to conducting clinical research in different forms of vasculitis. The VF has partnered with the VCRC since its creation in 2002 to recruit patients with vasculitis to participate in research and to connect researchers with patients. Summary: The VCRC-VF Fellowship is a mentored training program of up to two years for physician-investigators who have a strong interest in vasculitis and wish to pursue a period of specialized training with an emphasis on clinical and/or translational patient-oriented clinical investigation. The trainee will undertake the Fellowship between 2014-2019 at a VCRC-affiliated site in North America that has an established distinct clinical and research program in vasculitis and availability of senior faculty mentors. 1. For the Fellow to be involved in the care of enough patients with various forms of vasculitis to develop experience and expertise in the diagnosis and management of patients. 2. To familiarize trainees with the major unmet research needs in vasculitis, the investigative techniques used in clinical and translational research in vasculitis, and understand how to conduct high-quality clinical research in vasculitis. 1. The candidate must be an MD (or equivalent) committed to a career in clinical investigation. 2. The candidate must have finished a residency and (preferably) have some sub-specialty training relevant to vasculitis. Candidates from various subspecialty backgrounds are encouraged to apply. 3. The VCRC Fellowship training will take place after the applicant has completed a formal subspecialty fellowship. 4. The candidate must have a training license or full license to practice in the state/province where the Fellowship will take place from the START of the Fellowship/funding period. 5. The fellow must be a citizen of the host country or have a valid visa that is acceptable to the host site from the START of the Fellowship/funding period. 6. Preference is given to candidates who propose research related to ongoing VCRC projects, but new projects that capitalize upon VCRC resources or augment areas of VCRC emphasis are also acceptable. 1. VCRC-VF Fellows will devote 100% of his/her professional time on Fellowship-related activities. 2. VCRC-VF Fellows will comply with all requirements and guidelines as outlined in this document as well as additional reasonable stipulations or requests from the VCRC Steering Committee. 3. VCRC-VF Fellows will provide updates on their careers to the VCRC, upon request, for at least 10 years following completion of the Fellowship and will ensure the VCRC has active and accurate contact information for the Fellows at all times. 1. Research/clinical fellow for two years which includes a minimum of two half-days per week in a vasculitis clinic over two years, combined with a research project(s) under the guidance of mentor. Necessary didactic training is required; preference given to those willing to complete a Master’s degree or research certification program. 2. Clinical fellow for a one year which includes three to four half-days/week of clinical training in vasculitis and includes some didactic curriculum to assist in carrying out research. A research/academic project is expected to be completed in this time frame. For more information on the VCRC-VF Fellowship Program, please contact Joyce Kullman, VF Executive Director. Click here to access the application and requirements. 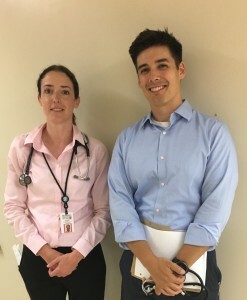 Dr. Walsh said that he is particularly excited to be mentoring Dr. Rodrigues because she is bringing a stellar background in basic immunology and a longitudinal clinical experience to her new role. With the support of the Vasculitis Foundation, I intend to conduct a pilot clinical trial examining whether long-term low dose prednisone is effective at preventing relapse of ANCA-associated vasculitis and its impact on kidney function with a particular focus on the side effects of prednisone and its impact on patients’ quality of life. You have said that Glomerulonephritis (GN) is the next big development in our area of study. Please explain Glomerulonephritis and why it needs greater research. Glomerulonephritis (GN) is a complex and rare disease that is the second most common cause of kidney failure. Specialized clinics, as well as an increase in the amount of clinical research in this area will translate into improved outcomes. There are many types of GN in addition to vasculitis, and these patients frequently receive long-term immunosuppressive medications to control their disease. Personally, what does this VF Fellowship mean to you? How do the VF Fellowships advance our understanding of vasculitis?This fellowship will provide me with the opportunity to improve the care provided to patients with vasculitis. I am fortunate to have many excellent mentors within the field of vasculitis and glomerulonephritis and to be among the many previous successful recipients of this fellowship. On the first day of her longitudinal clinic, I observed Medha during a full encounter with a new patient, and I was impressed with both her clinical and communication skills. She is kind and puts her patients very much at ease. Medha is an excellent listener and does not interrupt, and still directs the interview. She is very responsible and follows up on her lab work and imaging studies. Medha is curious, searches the literature without being asked and asks good questions. A number of patients have spontaneously commented to me on how impressed they were with her kindness and thoroughness. Medha is a bright young woman who is very motivated in orienting her career in the field of vasculitis. “My first peek into the field of rheumatology was when, as a fourth-year medical student, I did a rheumatology rotation. 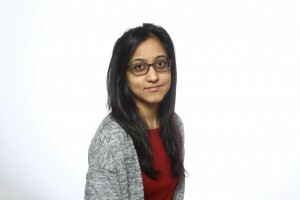 What initially struck me was the wide variety of diseases that this field entails,” recalls Medha Soowamber, the recipient of the 2015 Vasculitis Research Clinical Consortium – Vasculitis Foundation (VCRC-VF) clinical fellowship.